If you’ve seen the new commercials with Ryan Seacrest being followed around by a sea of women for his fresh breath, it’s because he’s using three new Outlast products including Scope Outlast mouthwash, Crest Extra White Plus Scope Outlast toothpaste, and Oral-B Floss Picks Plus Scope Outlast. 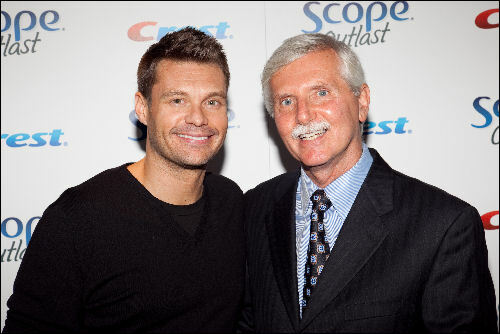 Ryan recently hosted an event at the Huntley Hotel in Santa Monica, California to talk about the products and introduce the man behind the technology, Dr. Gerlach. While guests enjoyed delicious appetizers and sipped on wine, Ryan confessed that he was approached to be the spokesperson more than three years ago after publicly talking about his dating life. But the charming American Idol host didn’t just talk about the products, he also commented on the latest news surrounding his reality competition show. “Paula is not there. She is a friend and Ellen and I will be sharing suits,” Ryan joked.